Surveying skills are being retrofitted these days for some stunning and innovative new applications outside of industry mainstays, such as building and construction. And the total station, that most ubiquitous surveying tool, is finding new roles. The total station has landed a starring role in an unlikely location: the back lots of Hollywood. Of course, when taking center stage in Tinsel Town, timing is everything, and the total station was not only ready for its close-up, it was also in high demand. How did this odd coupling come about? Like any great Hollywood story, it was a combination of coincidence and networking. Lightcraft Technology, a virtual movie set production company in Venice, California, needed a total station to help it marry visual effects with actors and action sequences in real time, flawlessly. It just so happens that ABC Surveying Instruments, based in Glendale, California, offered positioning solutions for the cinematography industry. A total station is the workhorse making this possible. The two firms met and successfully developed a way to create problem-free visual effects in pre-production. Up to this point, it was assumed that pre-production of any project involving visual effects would be mostly accurate; the visual effects and actors would blend on screen perfectly. Yet because they rarely meshed, there was an immense amount of technical fine-tuning occurring in post production, a situation directors abhor due to the resultant schedule delays and mounting costs. The dilemma in 2003 was so frustrating for cinematographer Eliot Mack (founder of Lightcraft) that he decided to apply his background in robotics to create a machine that could help his visual effects appear more realistic in an effort to make them look convincing in real time while the camera moves. “One of the huge problems in visual effects is trying to take something synthetic and match it with something in the real world so that it looks seamless,” Mack explains. Developing a solution to creating that seamless effect is a problem that has taken Mack and his virtual movie set production company Lightcraft Technology years to work out. “Part of solving this problem is figuring out where the camera is,” Mack said. “To do this well, you need to have very good reference points.” As its vision sensor, Lightcraft Technology uses a small Intersense camera, an aerial camera that is attached to the main camera which moves through a scene during shooting. The Intersense camera can look up and see a set of fiducial markers on a ceiling or scattered around a stage, establishing its position relative to the reference points. 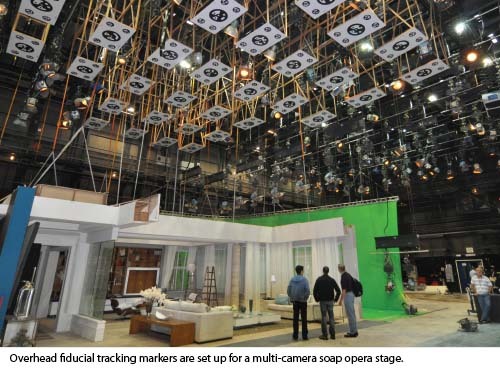 Fiducial markers are any fixed points on set that the aerial camera uses as a fixed reference in the captured image. There are usually four fiducial marks on a photograph, and these are used to define the primary point or position of the photograph. “To be able to solve the camera’s position, you need to know where the markers are, and that’s where the total stations came in—using small portable grids—and we just measure out where the targets are on the grid,” Mack said. Mack and his team helped achieve the dazzling visual effects in the 2010 extravaganza movie Alice in Wonderland using this method. One of the groups involved in the movie’s production was a key visual effects vendor. The vendor was using total stations to survey its own tracking markers. Such markers in most cases are mounted on what is called a greenscreen, a specially colored screen that helps a visual effects team remove the original green background and replace it with the background of the movie. When shooting against a greenscreen, Mack explains that it’s best to place pieces of different-colored tape all over the screen. “Then you can survey these markers with a total station, which helps you going into post production to figure out exactly how the camera moved,” Mack said. After seeing other visual effects vendors using total stations, Mack knew he also had to get one of his own if he hoped to achieve the highest quality blend of visual effects and real-time action. Making his decision more urgent was the fact that several of Lightcraft’s customers already had purchased their own total stations to calibrate stage sets. Mack learned of ABC Surveying Instruments and its customized positioning solutions for cinematography applications. ABC’s CEO, Dr. Ohan Baghdassarian, showed Mack how to survey points on a set for the virtual reality filming projects that Lightcraft was working on. ABC Surveying built customized software to help coordinate the roles of the visual effects camera and total station. Today Lightcraft Technology sells the software along with a Sokkia 550RX Reflectorless Total Station to its customers so they can create feature films and television programs with seamless visual effects and live action during production. They chose the Sokkia 550RX because it can accomplish pinpoint, high-accuracy measurements at locations that are difficult to reach, such as those on a cinematography stage set. Also, the Sokkia total station shoots up to 1200 feet reflectorless, which is particularly helpful for lengthy outdoor shooting. With these steps completed, on the actual shooting days the Lightcraft system, called Previzion, can lock to the position as the camera moves freely inside its shooting area. Previzion is the virtual studio production machine that pulls in all the data from the different shooting sources—the total station, trackers, and camera lenses—and handles the real-time visual effects processing, after which it generates the real-time output. This all happens with help from the special software code that ABC Surveying Instruments created. The surveying code takes a series of targets, creates a map of the 3D fiducial positions, and generates a configuration file in the needed format. “And this [is the] format we take to go into formal production,” Mack said. Mack calls his firm’s Previzion system a technical breakthrough. And Lightcraft’s customers apparently view it that way too; he has added Zoic Studios, Stargate Digital, Universal Studios, and others to his portfolio of clients. Baghdasssarian sees the unusual role of the total station in Lightcraft’s application as a good example of one of the many possible positioning solutions the instrument can offer and an alternate industry niche that traditional surveyors might consider. “You have an advantage being a surveyor these days,” Baghdassarian observes. “Because with a surveying background there are many different opportunities to pursue with your skills, knowledge, and equipment.